Bose SoundSport Pulse review | What Hi-Fi? Bose doesn’t just make active noise cancellation earphones that zap the sound of outside noise. The SoundSport Pulse wireless earphones have an inbuilt heart rate sensor to let you see how hard you’re working during your runs or gym sessions. At £170, they’re not cheap, but the tech and sound are both solid. Comfort is perhaps the most common strong point among Bose headphones. The giant earpieces of the Bose SoundSport Pulse wireless look like they might buck the trend, but thankfully they don’t. The SoundSport Pulse wireless use soft silicone in-ear hooks, and these are the only parts that come into contact with your ears. As the actual earphones are much lighter than they look, these are actually surprisingly comfortable earphones. Bose’s reputation for great comfort is intact. They’re not exactly lookers though. The black earpieces stick out from your ears quite a way, and are far more conspicuous than previous Bose models. You can hook them up to your phone using Bluetooth, but they also have NFC to let you pair devices just by touching the two together. Wireless performance is excellent, with great stability and real-world range bang on the claimed nine metres as long as you don’t put walls between the Bose SoundSport Pulse wireless and the source. The downside of a tech-packed approach is that these headphones don’t last that long from a charge. Five hours of use won’t cut it for all-day use, although the Bose SoundSport Pulse wireless are really best suited for runners, gym fans and those looking for a pair for their work commute. They’re recharged using a microUSB hidden under a flap on one earpiece. There’s no active noise cancellation here and you can’t use them wired, but there is a heart rate sensor built into the left earpiece. It’s far more useful than the optical sensors used in smartwatches, whose accuracy tends to nosedive as soon as you start moving. The Bose Connect app displays your current heart rate, but it’s not desperately useful as it doesn’t record changes in heartbeat throughout a workout. There’s just a live read-out. However, the information can be sent to most of the top fitness apps, including Strava, Endomondo and MapMyRun, making it more meaningful. At times the system failed to pick up on our heart rhythm, and it can take a handful of seconds for it to settle down to an accurate reading, but it’s far less of a chore to use than an ANT+ chest strap. The Bose SoundSport Pulse wirelesses also have a three-button remote, which is where the NFC chip lives, and there’s a shirt clip on the neckband to stop the wire from banging against your neck. The sound is enjoyable. It’s rich and smooth, with powerful bass that’s particularly handy if you’re running out in a noisy environment, which can cut down the perceived bass level. Perhaps more than anything else, this is a fun sound, one that’s going to be easy to listen to for hours on end. A focus on enjoyment rather than insight or ultra-precision detail won’t please everyone, but it’s a perfect fit for this style of earphone. There’s some mid-bass padding that makes the Bose SoundSport Pulse wireless in-ears a little less clear and nimble-sounding than normal £170 earphones. However there’s invariably some compromise on sound when some of the budget has been spent on wireless tech rather than being piled into headphone basics. Again, this fuller tone is perfect when the earphones are likely to need to compete with the noise of a gym or the city. Alternatives may boast better battery life, but few sporty wireless sets will have a more consistent, cohesive sound. There are improvements to be made in the Bose SoundSport Pulse wireless earphones. Future versions are likely to have better battery life, with any luck, and smaller earpieces. 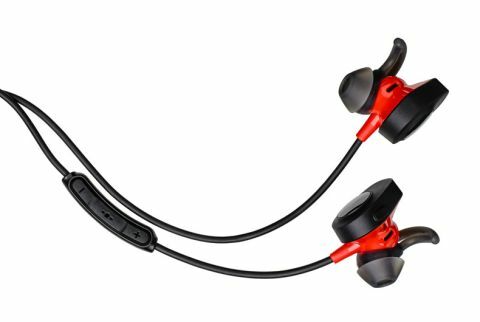 But if the odd look and potential for every-day charging aren’t off-putting, these are very solid sport earphones. The sound is fun and consistent, and the comfort far better than you’d guess to look at this pair.